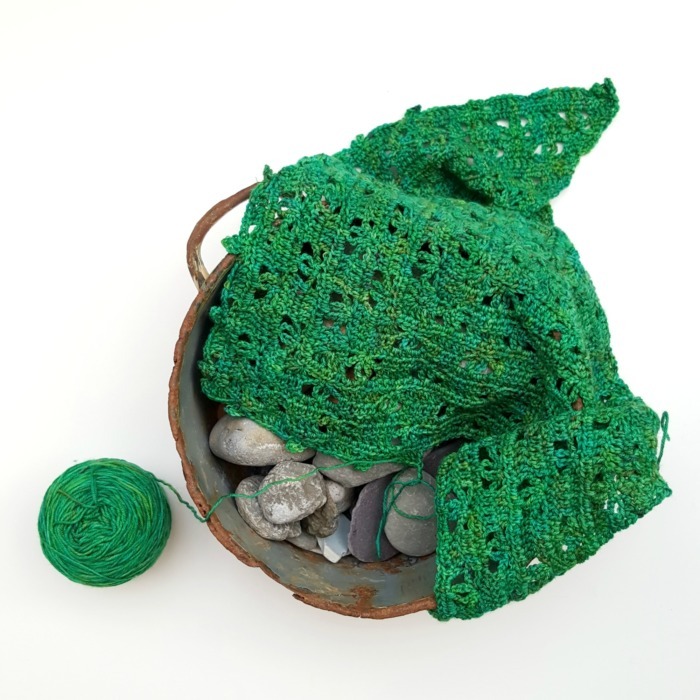 On Wednesday, I told you all about my last retreat with Devon Sun Yarns in October. I also told you that I would be sharing the pattern for the Banksia Shawl (which has been exclusive to the retreats until now) soon. Well, here, for your crocheting pleasure, is the pattern. I have not done a photo tutorial for this pattern because it is quite simple, but if you need any help, feel free to contact me through the comments on this post or via email. Add the Pattern to your Ravelry Queue or buy the ad-free PDF of this pattern in my Ravelry Store. 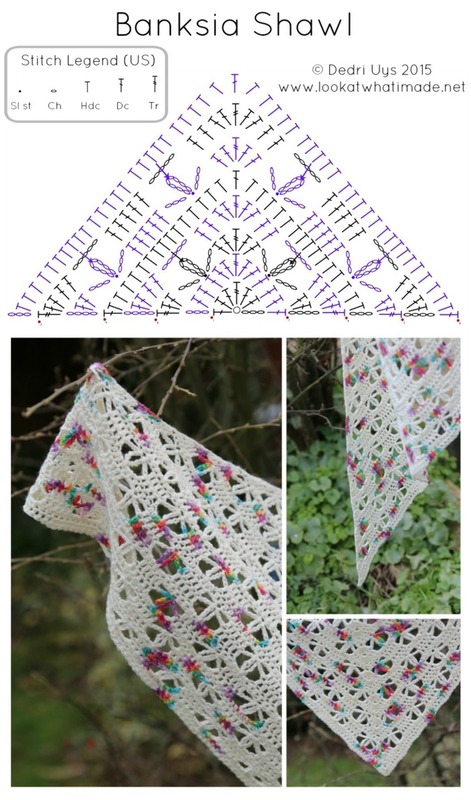 If you do not wish to purchase the formatted PDF, you can use the Print-friendly button at the bottom of this post to save/print the pattern. Sock weight yarn – 300 – 400 meters (100 g), depending on personal tension. I used Devon Sun Yarns Sprightly Rainbow Strike, but it works with any of the Devon Sun Yarns sock yarns. See Yarns below. 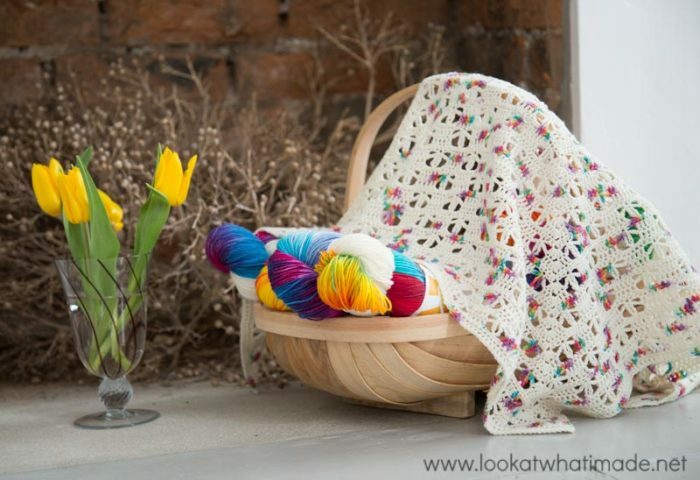 You can make this shawl with any sock weight yarn of your choosing. The Banksia shawls I have had the privilege of seeing (in progress or completed) have all been made with Devon Sun Yarns hand dyed sock yarn. My favourites are the ones made in Sprightly, Dazzler, and Gleam (Silk Merino). Banksia Shawl in different Devon Sun Yarns sock weight yarns, made at the February 2016 Retreat. I am working on another Banksia Shawl, this time with yarn I dyed myself at the last retreat. Flower: Ch 3, skip the next 2 st’s and sl st in the next st. Ch 8 and sl st in the same st to form a loop. Ch 3 and skip the next 2 st’s. Mark the central stitch of your ‘point’ to help you find it in the next round. ©Dedri Uys 2016. All Rights Reserved. Make a magic ring. Ch 3 (counts as first dc). (2 dc, tr, 3 dc) into the magic ring. Ch 3 (counts as first dc). Dc in the same stitch (at the base of the ch-3). Dc in the next 2 st’s. (2 dc, tr, 2 dc) in the next st, which should be the tr. Dc in the next 2 st’s. Make 2 dc’s in the top of the beginning ch-3. Ch 4 (counts as first tr). Make 2 dc’s in the st at the base of the ch-4. Ch 3, skip the next 2 st’s and sl st in the next st. Ch 8 and sl st in the same st to form a loop. Ch 3 and skip the next 2 st’s. This is your first Flower made. (2 dc, tr, 2 dc) in the next st, which should be the tr. Ch 3, skip the next 2 st’s and sl st in the next st. Ch 8 and sl st in the same st to form a loop. Ch 3 and skip the next 2 st’s. This is your second Flower made. (2 dc, tr) in the top of the beginning ch-3. Ch 4 (counts as first tr). Make 2 dc’s in the st at the base of the ch-4. Dc in the next 2 st’s. Ch 5 and skip the Flower. Dc in the next 2 st’s. (2 dc, tr, 2 dc) in the next st, which should be the tr. Dc in the next 2 st’s. Ch 5 and skip the Flower. Dc in the next 2 st’s. (2 dc, tr) in the top of the beginning ch-4. You should have 5 st’s at the start and end of the row and 5 st’s at the ‘point’. Ch 3 (counts as first dc). Hdc in the st at the base of the ch-3. Hdc in the next 4 st’s. Make 2 hdc’s in the next ch-5 space. Catch the ch-8 loop by making a hdc through the ch-8 loop AND the ch-5 space. Make 2 hdc’s in the same ch-5 space. Hdc in the next 4 st’s. (Hdc, dc, hdc) in the next st, which should be the tr. Hdc in the next 4 st’s. Make 2 hdc’s in the next ch-5 space. Catch the ch-8 loop by making a hdc through the ch-8 loop AND the ch-5 space. Make 2 hdc’s in the same ch-5 space. Hdc in the next 4 st’s. (Hdc, dc) in the top of the beginning ch-4. Ch 4 (counts as first tr). Make 2 dc’s in the st at the base of the ch-4. Make a Flower. Dc in the next 5 st’s. Make a Flower. (2 dc, tr, 2 dc) in the next st, which should be the dc. Make a Flower. Dc in the next 5 st’s. Make a Flower. (2 dc, tr) in the top of the beginning ch-3. Ch 4 (counts as first tr). Make 2 dc’s in the st at the base of the ch-4. Dc in the next 2 st’s. Ch 5 and skip the next Flower. Dc in the next 5 st’s. Ch 5 and skip the next Flower. Dc in the next 2 st’s. (2 dc, tr, 2 dc) in the next st, which should be the tr. Dc in the next 2 st’s. Ch 5 and skip the next Flower. Dc in the next 5 st’s. Ch 5 and skip the next Flower. Dc in the next 2 st’s. (2 dc, tr) in the top of the beginning ch-4. You should have 5 st’s at the start and end of the row and 5 st’s at the ‘point’. Ch 3 (counts as first dc). Hdc in the st at the base of the ch-3. Hdc in the next 4 st’s. Make 5 hdc’s in the next ch-5 space, catching the ch-8 loop with the central hdc. Hdc in the next 5 st’s. Make 5 hdc’s in the next ch-5 space, catching the ch-8 loop with the central hdc. Hdc in the next 4 st’s. (Hdc, dc, hdc) in the next st, which should be the tr. Hdc in the next 4 st’s. Make 5 hdc’s in the next ch-5 space, catching the ch-8 loop with the central hdc. Hdc in the next 5 st’s. Make 5 hdc’s in the next ch-5 space, catching the ch-8 loop with the central hdc. Hdc in the next 4 st’s. (Hdc, dc) in the top of the beginning ch-4. Ch 4 (counts as first tr). Make 2 dc’s in the st at the base of the ch-4. (Make a Flower. Dc in the next 5 st’s) until there are 5 st’s left before the ‘point’. Make a Flower. (2 dc, tr, 2 dc) in the next st, which should be the dc. (Make a Flower. Dc in the next 5 st’s) until there are 6 stitches left. Make a Flower. (2 dc, tr) in the top of the beginning ch-3. Ch 4 (counts as first tr). Make 2 dc’s in the st at the base of the ch-4. Dc in the next 2 st’s. (Ch 5 and skip the next Flower. Dc in the next 5 st’s) until there is one Flower left. Ch 5 and skip the last Flower. Dc in the next 2 st’s. (2 dc, tr, 2 dc) in the next st, which should be the tr. Dc in the next 2 st’s. (Ch 5 and skip the next Flower. Dc in the next 5 st’s) until there is one Flower left. Ch 5 and skip the last Flower. Dc in the next 2 st’s. (2 dc, tr) in the top of the beginning ch-4. You should have 5 st’s at the start and end of the row and 5 st’s at the ‘point’. Ch 3 (counts as first dc). Hdc in the st at the base of the ch-3. Hdc in the next 4 st’s. (Make 5 hdc’s in the next ch-5 space, catching the ch-8 loop with the central hdc. Hdc in the next 5 st’s) until there is one ch-5 space left. Make 5 hdc’s in the last ch-5 space, catching the ch-8 loop with the central hdc. Hdc in the next 4 st’s. (Hdc, dc, hdc) in the next st, which should be the tr. Hdc in the next 4 st’s. (Make 5 hdc’s in the next ch-5 space, catching the ch-8 loop with the central hdc. Hdc in the next 5 st’s) until there is one ch-5 space left. Make 5 hdc’s in the last ch-5 space, catching the ch-8 loop with the central hdc. Hdc in the next 4 st’s. (Hdc, dc) in the top of the beginning ch-4. Repeat Rows 9 – 11 until you have made 47 Rows in total. At this point, you should have between 10 and 14 g of yarn left. Last Row: Ch 4 (counts as first tr). Make 2 dc’s in st at the base of the ch-4. Dc in each stitch until you reach the tr at the ‘point’. (2 dc, tr, 2 dc) into the tr. Dc in each stitch until you reach the beginning ch-3. (2 dc, tr) into the beginning ch-3. 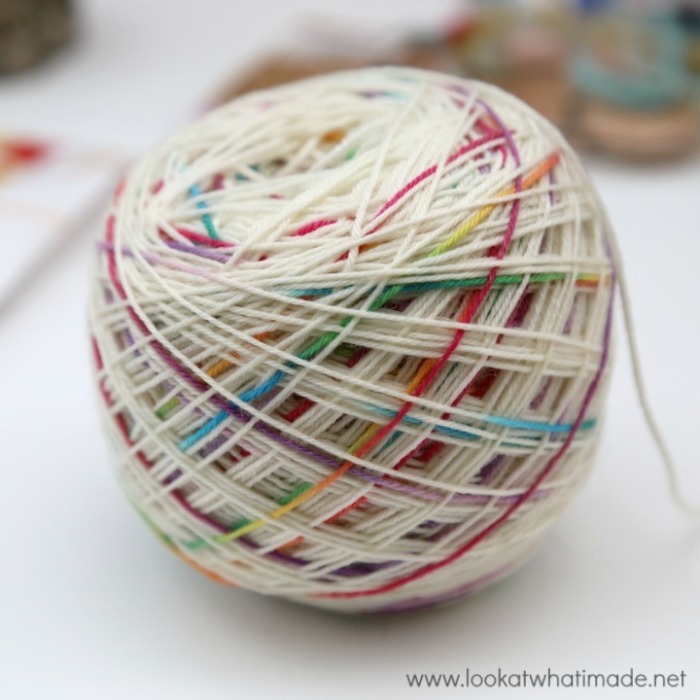 Fasten off and work away your yarn ends. For best results, you should block your shawl before wearing it. I usually use exercise mats and blocking pins, but I have lent my pins to a friend, so I used normal sewing pins, which work just as well. If you make this shawl, please share some photos using hashtag #banksiashawl. If you want to see more photos of the shawls made at the retreats, please have a look at #devonsunyarnsretreat on Instagram. If you like this pattern, you might also like my Monday Blues shawl. Dedri, I just wanted to thank you for this wonderful pattern. I made one for myself a month ago and have since made two more at the request of my sister in law and cousin! Hi Sarah. Have you shared any photos? I would love to see. Banksia is quite close to my heart. Hi Dedri, I was wondering if you were okay with selling items made from this pattern? Is it alright to sell if I credit and link back to you if selling online ? BTW, this is one of the funnest stitches I think I’ve ever done. Hi Kristen. You are welcome to sell as many as you can make :) There is no need to link back to me, although it is always appreciated. I’m so glad you like the stitch! Very kind of you, thank you so much!! Small problem here. 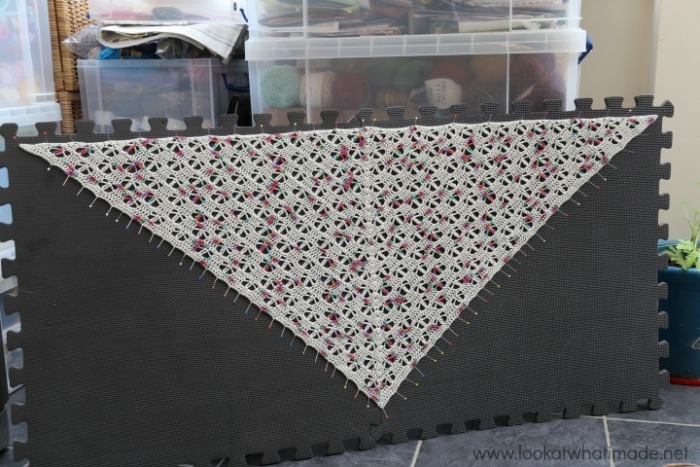 Do you have a video or picture tutorial for the Banksia Shawl? I keep doing the first flower, which I assume is the center of the top of the shawl — when I complete the flower, it looks weird, nothing like the picture of the shawl. Thanks for your help. Hi Diana. Have you got a photo? The first flower is not the center of the shawl. If you have a look at round 3 of the chart, you will see that each of the two sides has a flower in the center of the side, not at the ‘tip’. I’m stitching mine out of Scheepjes Spirit in Dragonfly. 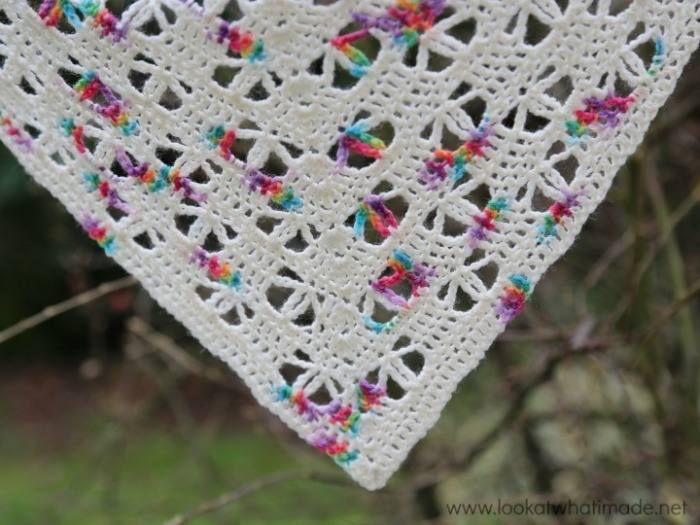 I think it will make a lovely lightweight shawl for spring and summer. Thank you for sharing the pattern. As always, it is well written and easy to follow. Please share pics when finished, Julie! A Spirit banksi Shawl will look fabulous! 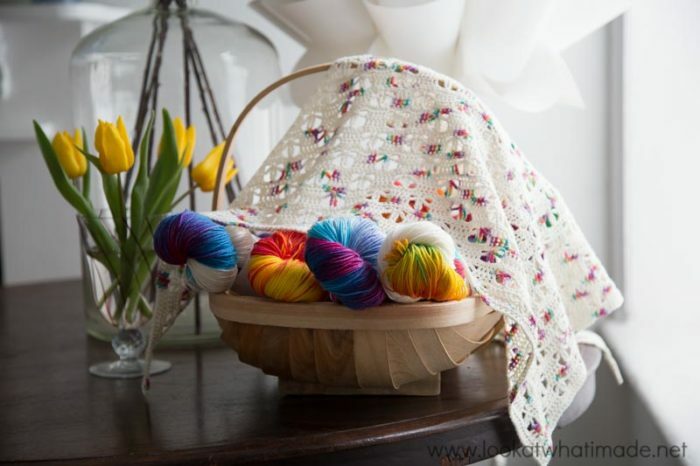 Thank you Dedri, I have some sock yarn that is perfect for this lovely shawl. I can’t wait to see! I saw you were using some Pook GB before. 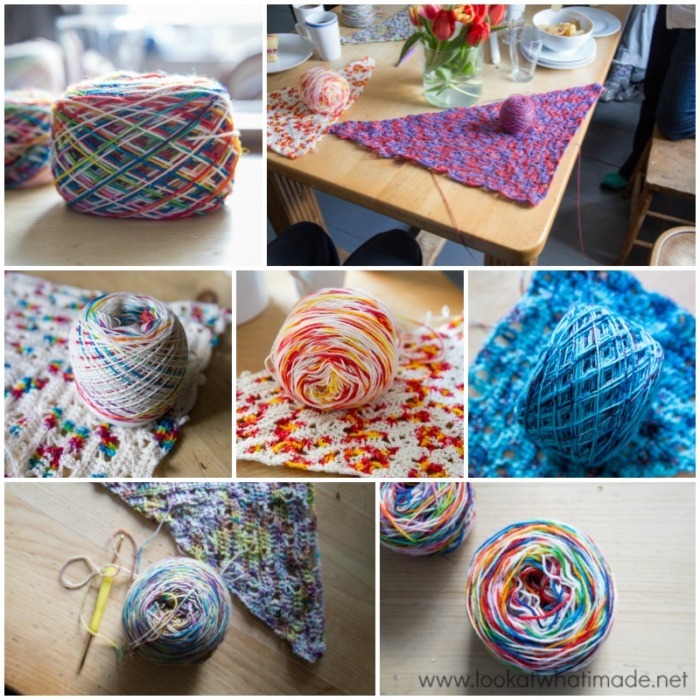 Gorgeous yarn! !